How many times have you been handed a receipt that you just toss into the next trash receptacle you pass by? When’s the last time you recycled your tube of toothpaste? Chances are, there are dozens of things every day you’re tossing without realizing they actually belong in your recycling bin. And who can blame us? While the basics of recycling are simple, not all brands or products make it intuitive as to what belongs in the trash or recycling bins. It can also be a challenge to recycle depending on where you are and what resources are available to you. But knowledge is power, and knowing what surprising items are recyclable is a good way to plan ahead or put aside items to be recycled later. Recycle Nation has compiled the following list of items you’re most likely sending to landfills instead of off to be recycled into something else. About half of us never recycle bathroom items, according to a 2015 Keep America Beautiful survey. Reason being, there’s often no recycling container in a bathroom. Among these products are recyclable items like shaving cream canisters, toilet paper rolls, toiletry bottles for shampoo, conditioner and body wash, and even toothpaste tubes. It’s not a bad idea to invest in a small, three-bin sorter for bathroom garbage so no one in your household makes the mistake of tossing recyclable items again. Stop at any gas station, convenience store, retail outlet, drive-thru, or restaurant and you’ll probably be handed a tiny little receipt. Let’s be honest—how often do you save that piece of paper to recycle later? More than 1 billion gallons of water, 250 gallons of oil, and 10 million trees are used up every year to make receipts in the United States. That generates 1.5 billion pounds of waste annually. You can do your part by letting the person working at the checkout counter know you don’t want a receipt to be printed for you. But when you are handed a receipt, you can recycle it! 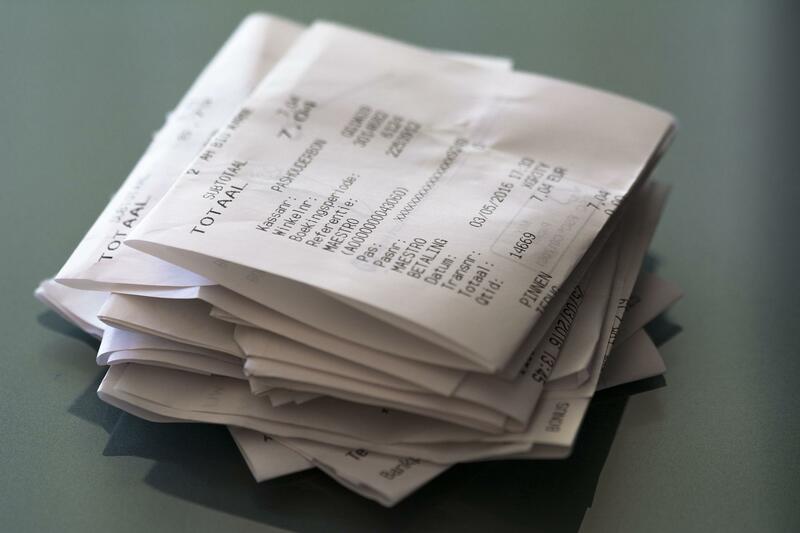 The only receipts that can’t be recycled are those coated with shiny chemicals to make them smooth. All other receipt papers can go directly into your recycling bin. Ink cartridges are among the more annoying items to recycle, since they have to be taken to specific locations like your local Staples (which will give you $2 back per cartridge, up to 10 cartridges a month). Most office-supply stores will accept old ink cartridges, though they might not all give you cash back. It’s at least worth keeping your cartridges in a box until you have about 10, then call around to see where you can drop them all off at once. I know, I know: You probably are totally sure that you always recycle paper. But you have to keep in mind that every little scrap of paper that you inadvertently put in your garbage pail adds up over time. In fact, Americans are estimated to only recycle half of the paper in this country. If you work in an office where paper isn’t being recycled, sit down with your managers to see if you can enact a recycling system for employees. This is a great opportunity for team building, and lots of recycling services offer a break for the first few months of signing up.